Single strand of white and grey fresh water pearls. 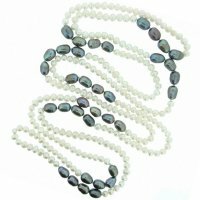 A long designer pearl necklace of cultured baroque white pearls and soft grey pearls. 62 inches / 160cm. long.